Service Dog Training has become more popular over the years. As we discover more ways dogs can assist the disabled community, there is an increasing demand for service dog trainers. The Academy of Pet Careers offers a service dog training program for those student who wish to take their training to the next level. Bundled with other advanced skills such as scent detection training, we offer a Specialized Trainer Program. This program allows students the option of providing niche services to their clients upon graduation. Students in our Specialized Training Program will focus on mobility assistance skills. The following training skills will give them the tools needed to step into the field of mobility service dog training. Call Us Today at (636) 778-4989 To Learn More! To become a service dog trainer, it takes skill and expertise in basic and advanced obedience. Because service dogs are more than just pets, they must perform their "job" consistently and effectively. This is why the standard must be much higher than basic obedience can achieve. Students who enter into our Specialized Trainer Program, must pass all of the skills required in our Professional Trainer Program. They must show that they have a knowledge of the fundamentals before they can advance into more advanced training skills. According to the Americans with Disabilities Act (ADA), dogs are the only species that can be a service animal. 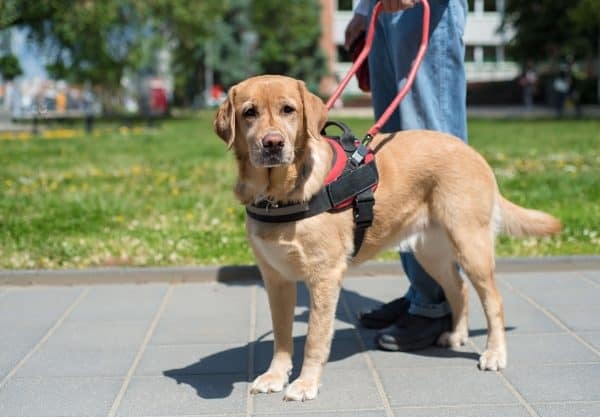 The official definition says a service dog is, "any guide dog, signal dog, or other dog that has been trained to provide assistance to an individual with a disability." In other words, it is not simply a pet that provides comfort to it's owner. It’s also not just a well behaved, well trained dog that is polite in public. A service dog has been trained to a high standard to perform specific skills. Such skills allow people with mental or physical disabilities to live more independent lives. Learn more about the 10 Types of Service Dogs!